Baby, it’s cold outside! Shouldn’t be a surprise as it’s December, but every time I walk out the door, brrr! 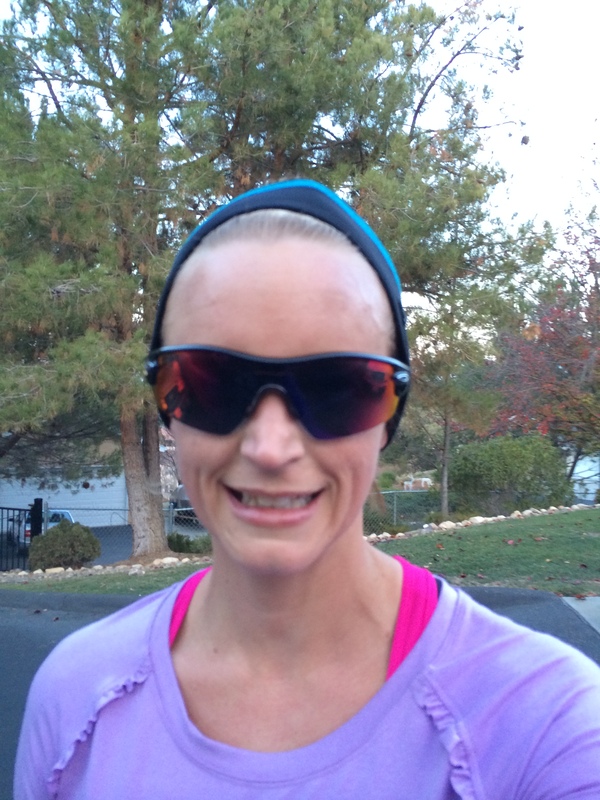 Yesterdays run was so cold, I think my cheeks were wind burned. Which is sad because it was around 38. Toasty compared to some other places. Pardon the bald look, my cheeks were so cold!!! I didn’t get back from shopping until almost 4 and the temperature was dropping but I wanted to run. I changed as fast as I could into what I hoped was warm and was running. I ran the exact same route as Saturday. Not sure if it was that I was feeling better or if the cold was the incentive but I took 4 minutes off of the previous days time. Woo hoo! I felt good and would have like to run more but the setting sun was against that. 😦 As I was stretching out afterwards, I realized just how pink I was. Not only were my cheeks pink and stinging, my clothes were too! 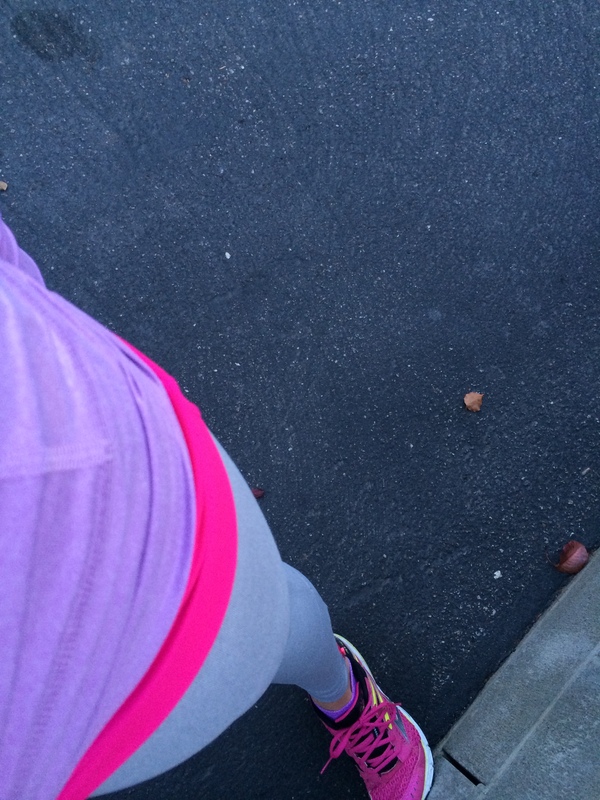 I don’t think I have ever worn that much pink before. Even the zippers are pink! This was also the first time I had ever run in full length pants not capris. I had picked them up while shopping on Sunday, and figured it was cold, why not try them out first thing? They were awesome. They never moved or slipped and felt comfy the whole time. The waistband was still higher than I would like but I think that’s just me. The odd thing is that I bought these exercise pants at Abercrombie (I know, I know, but I really like their sweaters, even when I was 40 lbs heavier). Random I know, but I have not been liking the pricey Nike capris or the numerous pairs of Fila I own. I had to go up a size and I was hoping for a lower waist but so far, worth the money. Which was the best part- $20! They washed well the first time, so now to see how long they last. I also picked up a running skirt (my first one!) on clearance at Sports Authority and a new pair of knee socks. I also finally treated myself to some new jeans (amazing Gap coupon!). I only had one pair. Losing weight is awesome, but it was a real hit to my budget. I don’t wear jeans that often but it was making things a little tricky. My mother on the other hand became a veritable clothes horse when she lost all her weight, so I was usually calling her on the Thursdays before Friday Jean Day, crying help! I need pants! My family is incredibly hard to Christmas shop for but I think I managed to pick something out for my brother. I am 99.9% positive that he does not read this, but just in case, that is all I am saying. Now if I can just figure out everyone else before Christmas. Managed to finish my Secret Santa shopping too, now fingers crossed, it gets here in time! At work, we finally managed to get our Christmas tree decorated, but this Slacker forgot to get a picture. I also apologized to my boss, because as I was tumbling on Friday, I managed to break one of her icicle decorations. Sorry!! The plan is to hit the gym tomorrow night and get a couple miles in on the treadmill. That will depend on how far I manage to get with my advertising plan. This post has been a wonderful distraction from the headache of formatting but I better get back to it! The Sing-Off is pretty distracting too 🙂 And I am on standby for jury duty again tomorrow, so who knows? I totally got wind burned on my run Sunday too! I’m still a little pink! I wore pants (a first for me too-I always worry about overheating) and a short sleeve shirt. I thought I would warm up and I froze the whole way. Lesson learned! My cheeks still stung yesterday 😦 A short sleeve? Yikes! I was wearing a tank top and long sleeves over that. It was so cold! No picture of the tree?!? I don’t believe! Best get on that, missy!